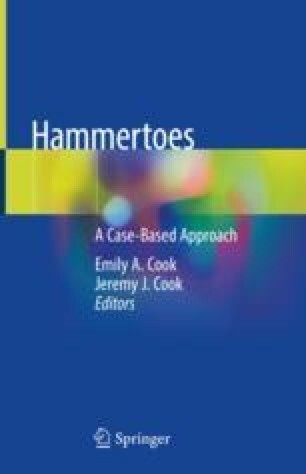 Hammertoe deformity can be classified in numerous ways, depending on the etiology, flexibility, and direction of deformity. Hammertoes may be flexible, semirigid, or rigid depending on whether it is reducible or not. The position may be adducted or abducted, varus or valgus, over- or underlapped with adjacent toes, and flexed to various degrees [1–4]. Although rare, hammertoes can be congenital . More commonly, hammertoes are acquired as a result of imbalances from intrinsic and/or extrinsic muscles influencing the metatarsal phalangeal and interphalangeal joints.